This article first appeared in the Spring 2000 issue of Dartmouth Medicine Magazine. An "inner commitment to serving"
Many of us recall a favorite teacher or special mentor, someone who brought enthusiasm to our learning or special guidance to our personal growth. For hundreds of Dartmouth Medical School students and Dartmouth College premeds during the years 1923 to 1960, Dr. Rolf C. Syvertsen provided both. Syvertsen, a member of the faculty and then dean at Dartmouth Medical School for more than 30 years, spent his entire career at DMS. He joined the faculty immediately upon his graduation from DMS in 1923 to teach anatomy and histology and to serve as secretary of the School. As secretary he was, in effect, the admissions officer, admissions committee, financial aid officer, registrar, and librarian. Named a professor of anatomy in 1938, assistant dean in 1944, and dean a year later, he continued to run the School largely single-handedly until the mid-1950s. From the beginning, "Sy" (as he was widely known) had a special sense of obligation to students and, because of this, his death in an automobile accident in 1960 was an especially tragic event for the many alumni who remembered him so fondly. To honor the memory of the man who influenced so many Dartmouth medical students, several alumni took the initiative in 1984 to establish the Rolf C. Syvertsen Memorial Fund. Led by Fletcher McDowell, DC and DMS '45, and one of his Dartmouth College classmates, the late Jim Andrew, the organizers of the scholarship fund originally had hopes of raising $300,000. The goal was later adjusted to $1 million, but the total still kept climbing. Today, the Syvertsen Fund has a market value in excess of $1.4 million. In April, Sarah Johansen, a 1989 DMS graduate and the current chair of the Syvertsen Scholarship Committee, will join other committee members in celebrating Rolf Syvertsen's finest qualities by recognizing DMS students of today who exhibit those same qualities. The committee is composed of alumni who attended DMS during the Syvertsen era, plus former recipients of the Syvertsen Fund awards. The Syvertsen Scholarship Committee will this year, as it does every year, choose a Syvertsen Fellow from among several nominated students who are finishing their third year; the other nominees are also honored, as Syvertsen Scholars. The nominations are made by DMS deans on the basis of academic excellence and participation in community service. A cash prize is given to the student selected as the Syvertsen Fellow, and scholarship awards, based also on financial need, go to the students named as Scholars. The first Syvertsen Fellow and Scholars were selected in 1986, and the committee has met every year since then. Johansen reflects on Rolf Syvertsen's unusual role in the lives of his students: "Rolf Syvertsen might turn heads today with his style, which some could interpret as intrusive. But he made others' lives his responsibility in a way that for those days was appropriate. He cared tremendously, and he wasn't afraid to have an impact on people's lives. He was looking beyond himself and investing his time and energy on someone else--however much controversy that might create. "He was not afraid to be a mentor," she goes on, "or to have a leadership role in people's lives. Today, with volunteerism at an all-time low, you have to wonder if some of that hasn't gotten lost. This award is trying to reward people who do reach out, who go beyond their personal comfort level to achieve service in the broadest sense." Johansen explains that the committee members, in making their selection, use criteria that reflect what Rolf Syvertsen worked so hard to foster in the students of his day and what Sy himself embodied: scholastic excellence of the highest order, breadth of human concern, community spirit, selfless mentoring of other students, and a deep love of medicine and of sharing their knowledge of it. "This is truly a unique award at DMS," Johansen notes. "It is one of the only scholarships that will show up on a student's record and, more importantly, it is an award that is sincerely recognizing excellence--all-around excellence--in academics and in a student's commitment to . . . the world around him or her." It is clear that out of all his many duties and responsibilities, personal knowledge of and involvement in the lives of his students were among Rolf Syvertsen's highest priorities. The manifestations of that commitment are legendary. Melvin Britton, DMS '58, has written about Sy's humanistic qualities: "Each of us felt that the dean took a personal interest in us. . . . In the fall of my second year of medical school, I married the love of my life. Dr. Sy was the one who stood as a father for me. This act of personal caring and intervention typified him. He was, in a sense, the 'father' of generations of DMS students during his time." "The people who knew Sy and who wanted to create a memorial fund in his name," Johansen observes, "really believe in Dartmouth and its ability to support and create wonderful physicians, and they're very excited about the kinds of physicians being nominated as Syvertsen Scholars. It is very meaningful for them that their alma mater is producing such wonderful physicians, with the qualities that they feel are so important, and that those qualities extend beyond the classroom." Johansen feels the award encourages students to continue doing meaningful things with their lives: starting or participating in new programs, tutoring undergraduates and peers, engaging in mission work or relief work. "These are students who do a lot with what they've been given," Johansen says. "We're looking for students who are going to have an impact wherever they are, something that will have an impact beyond their world. We look for evidence of an inner commitment to serving others, which was one of the more obvious qualities of Rolf Syvertsen." Merlin DuVal, DMS '44 tells a story characteristic of Sy's influence: "My most treasured memory of Sy was of his paternalistic ability to help each of us to work things out. In my case, I stood 21st in a class of 22. Consequently, when it came time to transfer for the third and fourth years, I picked Cornell, but was turned down. On learning this, Sy immediately got in touch with me and assured me that the school would change its mind. I'm not sure quite how he did it, but he was successful in persuading the school to accept me, and that was that." After Cornell, DuVal spent two years in the Navy and then finished his surgical training. He went on to a distinguished career that included numerous honors and resulted in a number of important surgical innovations. 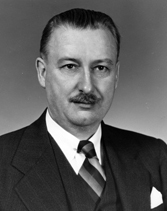 In 1963, he became the founding dean of the University of Arizona College of Medicine, and, in 1973, he was appointed assistant secretary of health in what was then the federal Department of Health, Education, and Welfare. Johansen says the Syvertsen awards embody a philosophy of living beyond medical school. "Medical school is not four years out of a your life, but four years of your life. You're developing patterns for your entire life, how you treat your peers, how you relate to community," she explains. "These things have to be treated as valuable parts of your life and be supported while you're in medical school and that's what DMS and this award is doing, much as Rolf Syvertsen did in his time." Contributions to the Rolf C. Syvertsen Memorial Fund are welcome. Please contact the Geisel School of Medicine at Dartmouth Office of Development at One Medical Center Drive, Lebanon, NH 03756, or 603/653-0700, to help support future Geisel School Syvertsen Fellows and Scholars.